Stupidity most definitely costs money, and this morning, Tesla (TSLA) is proving that, thanks to their CEO, Elon Musk. By now, we’ve all heard about the amazing rescue of the 12 Thai soccer players and their coach, but, of course, with anything good in this world, someone is proving they didn’t get enough attention as a child, and that someone is Tesla CEO, Elon Musk. 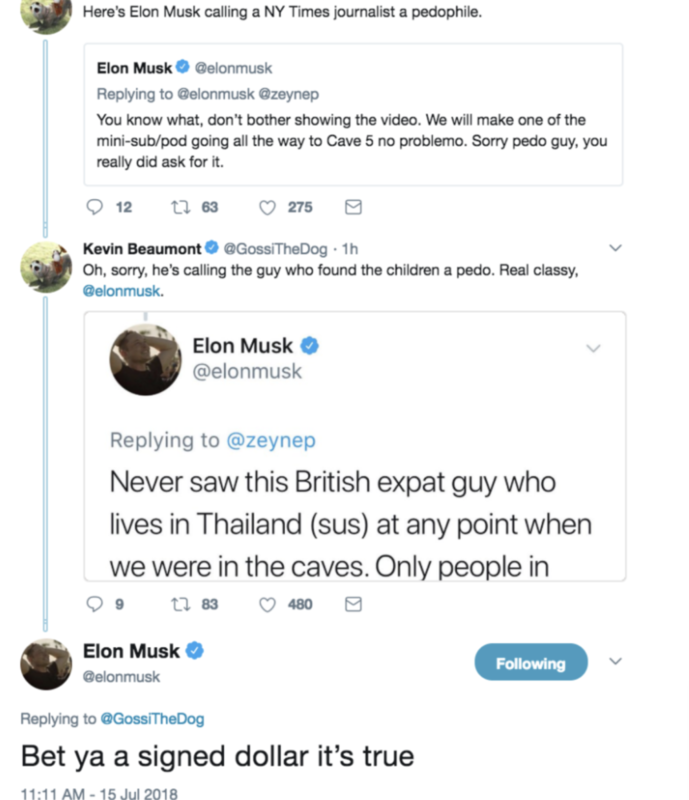 While Musk did do a nice thing by offering a child-sized submarine in an effort to remove the Thai children from a cave, once that idea was shot down, the often-irritable Musk struck back in way that has his PR team probably considering early retirement. So now, Tesla’s Stock (TSLA) is down 3.5% (11 points) based on their often-irritable CEO, based on the possibility that the diver Musk’s tweet was targeted to, may sue! So what’s the lesson here? The lesson is that book smarts obviously don’t equate to street smarts nor common sense, and in Musk’s case, he often doesn’t take the time to consider consequences prior to actually speaking, or in this case typing! The worst thing you can do is actually put something like this in writing, where you’re going to make such an accusation just out of spite. Musk has always been known as an attention-starved person, and in this day and age of social media, where everything you write and publish is out there forever, you simply can’t be that type of person. To make matters even worse, the PR teams of Space-X and Tesla are remaining quiet, and quiet means one thing – you know Musk did the action, and they aren’t savvy enough to come up with an explanation quickly! In a case like this, if a CEO, or higher-up in a company is a loose cannon, the worst thing you can do is remain quiet. Musk should already be out there apologizing; he should already be holding himself accountable, and should already have personally reached out to the individual. Musk didn’t need to make this about him, because, after all, if you’re publicizing the charity you do, you aren’t really doing charity at all, and instead making it more about what you are doing and how you look, than considering whom you’re doing it for. Think about that for a second. Musk wanted to help the situation, was offended at being turned down, and the manner for which he was turned down, and then struck back. He was looking to do charity, so to speak, and many people understand Musk is always wanting attention. But had Musk just made the offer, got turned down, and wished everyone well, he actually would have looked great because it’s the though that counts. This teaches us all, always think about consequences before you post something, but then, if you do something regrettable, own up to it, and accept accountability. Because stupidity costs money, and that is the real cost of not thinking before you speak.